This site is the University of Virginia Library’s web version of the physical exhibition From Out That Shadow: The Life and Legacy of Edgar Allan Poe displayed at the U.Va. Library’s main gallery at the Mary and David Harrison Institute for American History, Literature, and Culture from March to August 2009. The exhibition was curated by staff members from the U.Va. Library and the Harry Ransom Center at the University of Texas at Austin. This site is housed at the University of Virginia; it has been created to enable public access to these materials in support of teaching, research, and scholarship. The site contains images of original artwork, photographs, letters, manuscript items, and a variety of printed material from University of Virginia Library’s Special Collections, the Ransom Center, and the exhibition’s lenders. 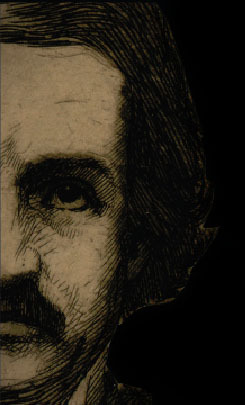 Additional Poe materials are available at the Ransom Center’s Poe Digital Collection http://research.hrc.utexas.edu/poedc/index.cfm. Acknowledgment for U.Va. Library materials should be given to the site as follows: From Out That Shadow: The Life and Legacy of Edgar Allan Poe © 2009 by the Rector and Visitors of the University of Virginia. For materials held by other institutions, any use or links should be cleared with the owning institution; see image captions for this information. Texts: Unattributed text is the collaborative work of University of Virginia Library and Harry Ransom Center staffs and is © 2009. Images: Some of the images are from the collections of the University of Virginia. Others were generously contributed by private individuals, public institutions, and other entities. Where known, the original photographer or source of the image is identified. For any items created and owned by the University of Virginia, high-resolution images should be requested from Digital Curation Services, http://www2.lib.virginia.edu/digitalcuration/services.html. Images from the Ransom Center’s Poe collections are available at http://research.hrc.utexas.edu/poedc/index.cfm. For items held by other institutions, please contact the appropriate institution indicated in the image caption.